20 Plastic Ninjas: Indispensible to board gamers. You can also use them as cake toppers! Although the industry has made great strides in recent years, there is still a massive shortfall in the number of plastic ninjas featured in most boardgames. Even games which are all about ninjas contain at most 15 or 16 plastic ninjas, some just use ninja cards. Taken as a whole, boardgames in the US are nowhere near the average of 20 plastic ninjas per game that Congress has mandated. Although there are rumors that the powerful Plastic Ninja Lobby had something to do with the passage of this legislation, I have faith in the integrity of Capitol Hill. 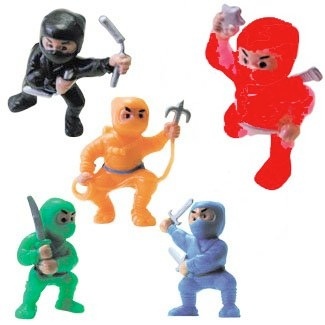 The fact is that plastic ninjas improve any game they are introduced into. Which would you rather move around a Monopoly board: a freaking top hat, or an awesome plastic ninja? Which would be more scary coming across the Bering Straits to attack Alaska: a bunch of little geometric tokens, or a horde of sweet plastic ninjas? Game designers have been resistant to throwing out their old, outdated ideas of what a board game should be. They have to accept that adding plastic ninjas is (A) Necessary, (B) Frigging Sweet, and (C) the law. As part of a $25 million dollar information campaign, Congress has authorized the production of these amazing figures, which also double as Ninja cake toppers for gamer birthday celebrations. Own them with pride, and let the fat cat game designers that you demand your plastic ninjas. Join in and write your own page! It’s easy to do. How? Simply click here to return to Game Pieces and Parts.